I've been sporting the same, boring hairstyle all my life. I'm scared of damaging my hair by experimenting on perm and color. I'm now 41 and for the new year, I guess I should be more daring. I cannot wait to share this sponsored post with you dear readers because I know some of you want something new happening in your life... even if it's just a new hairstyle. Don't you sometime wonder how some girls manage to keep a long, beautiful hair? Because I am struggling and seriously considering cutting my long hair soon but I want a wet and wavy hair look. Well, who says I can't have both? Black Hairspray offers a wide variety of high quality wigs that can instantly give you the look you've been wanting to have. 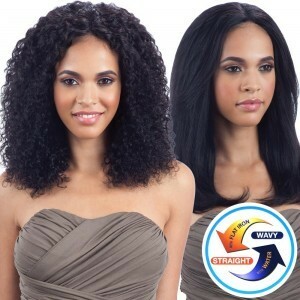 Shop from the comfort of your home and have the wig shipped directly hassle-free. You can even go from curly hair to straight or wavy the next day. I personally like the Shake-N-Go Naked Nature Wet & Wavy Weave – Beach Curl which is made from 100% Remy Brazilian human hair. I can style it any way I want (something I could not do with my own hair) and never worry about damaging my own hair just to achieve the look I want for the day. Shop now at Black Hairspray website and start sporting a new look without spending hours at the salon.